TOP HONORS: from left, Carolyn Elyce Trout, Abigail Jean Adkisson, and Taylor Mitchell Blythe received top honors during La Harpe 8th Grade Commencement Friday evening. 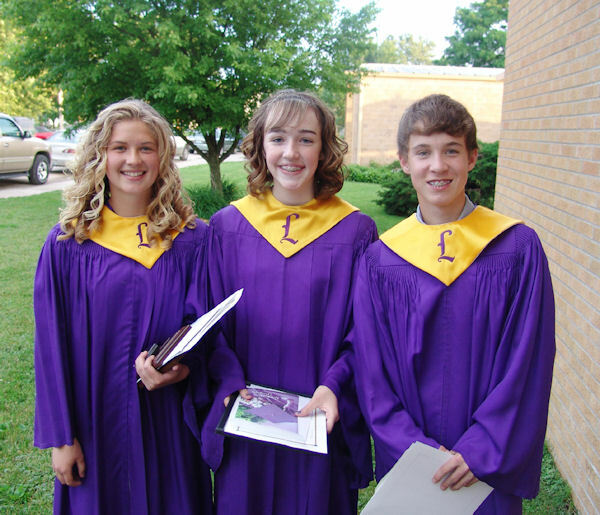 Twenty seven La Harpe 8th graders received their diplomas Friday at 7:00 p.m. Commencement ceremonies in the school gymnasium. The graduating class marched in with the Processional, "Pomp and Circumstance" played by the 6th & 7th grade concert band members. They were seated after the American Legion Post 301 presented the colors, Commander Darrell Kraft led in the Pledge of Allegiance, and Leighton Johnson gave the Invocation. Leighton asked a special blessing on their math teacher, Doug Jones, who has been diagnosed with cancer. A warm welcome was given by Dr. Jo Campbell, District Superintendent. A special song, "Will You Teach Me" was sung by the Junior High Chorus, conducted by Melissa Burt. Principal Lila McKeown announced, the President's Award for Academic Excellence which is awarded each year to La Harpe Junior High 8th graders who maintain a 3.5 out of 4.0 cumulative grade point average during junior high through the third quarter of 8th grade; and who receive a recommendation from a faculty or staff member. Highest Academic honor from the La Harpe Graduating Class went to Carolyn Elyce Trout, daughter of Randy and Denise Trout. Second in academics was Fisher Barrington Boyle, son of Rodney and Sally Boyle. Carolyn Trout also was awarded the Illlinois Elementary School Association Scholar Attitude Award on her essay "Sportsmanship". Only 30 of these State Scholar Attitude Awards were awarded throughout Illinois, two from each IESA district. "Students selected represent the finest junior high students in the state of Illinois. They have demonstrated their abilities in the classroom, on the playing fields, and in their communities." "These students will be the leaders of tomorrow," Lila McKeown, Principal, quoted from the Associations' Executive Director's comments. The 8th Grade Ensemble sang "The Gift Of Who You Are" directed by Melissa Burt. Following, the Masonic Lodge 195 award was given to the class member selected by faculty who met excellence with high moral standard, intelligence, compassion, perseverance and courtesy. The Masonic Lodge award went to Abigail Jean Adkisson, daughter of Lance and Shawna Adkisson. Darrell Kraft presented the American Legion Awards for Honor, Courage, Leadership, Scholarship and Service. The award winners were Carolyn Elyce Trout and Taylor Mitchell Blythe, son of Rob and Paula Blythe. Kraft, challenged both of them in whatever they do to be guided by the highest and holiest ideals. Lila McKeown made the presentation of the class for their diplomas and she was aided by Cindy Wear, Rex Huston, and Darren Spangler, Board of Education members. The American Legion Post 301 retired the colors and Boni Huston gave the benediction, praying that the class would keep the bond they have developed. The class marched out onto the front lawn to the Recessional played by 6th and 7th Grade Concert Band as the audience stood, then followed them outside to wish their congratulations and best wishes. The weather was sunshiny and clear to make it a beautiful evening for parties and gatherings.